Call me stupid but I accidentally found the gstat utility. It gives you a super-cool overview of what your disks are doing. Recently I came to a stupid problem when the first controller in the server – the boot one – came numbered last on FreeBSD. So the boot disk came to a /dev/da24. The problem was that this server is changing the number of disk, so the boot device would always change, leaving a non bootable OS because of the /etc/fstab mount file. and change /etc/fstab devices to boot from /dev/label/root and /dev/label/swap for swap. Always installed nload on the server for which I wanted to view the bandwidth usage on. If you read my article on ssh bouncing, you surely use it. One annoying thing is “Killed by signal 1” when exiting the bounced session. So the solution is to change the ~/.ssh/config file and add the “2>/dev/null” to the very end of the ProxyCommand line. Found the solution here. Thanks to merdely. This one is easier than previous (FreeBSD 7.x or older). 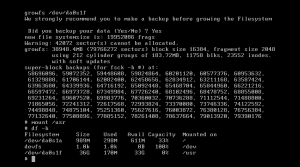 It may be possible to do it all live but you need to find a way for FreeBSD to see the growed disk size. Reboot for a clean feeling and you’re done. I’ve tried this on vmware ESXi4.1. First, shut down the server and enlarge the disk size in the VM config. Boot into single user mode (press 4 and boot). Check the block count of the new disk (seen at boot – dmesg) – in our case 419430400.
when asked, the start of the updated partition stays the default but the end of the partition you can write the block count of the new disk (419430400). Actual end is less that this size, but fdisk sees that and it suggests the correct number which you can agree on. you can check if all went well with fdisk -s. It should be the new block size (little less that the block cound of the disk) – write down this number. There you edit the number under “# “raw” part, don’t edit”. Funny 🙂 You must change the number here to the block count seen with “fdisk -s” after updating partition. And then change last line – usually entry “f” which is by default “/usr”. Remember that you can only grow the last partition !!. Change the first number of the “f” entry with the number which is number of blocks seen via “fdisk -s” minus the offset of the f entry (next number in line). 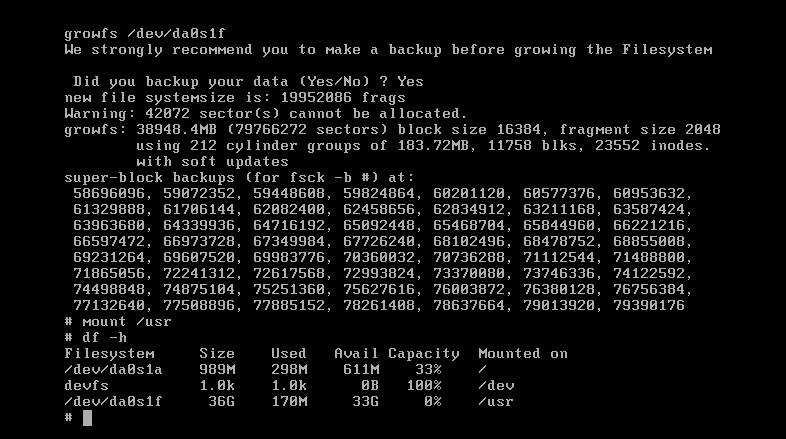 Now the partition is bigger but the filesystem doesn’t know about it. This is where growfs comes in (was surprised to see that it has been introduced in BSD 3.x). and there, you have resized partition. type CTRL+D to boot into the new – grown partition. I noticed that this procedure works only for version smaller than FreeBSD 8. It should work on higher versions but I’ve seen very unstable behaviour – kernel crashes… after using fdisk/diskabel. For versions FreeBSD 8+ the utility gpart (don’t confuse with gparted !! !t) is used which will be described in next post. In hope for an energy to revive this blog, a quick post. where 0002.725f.93c3 is the abusers mac address.